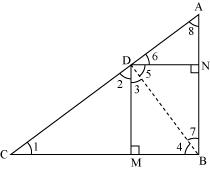 NCERT Solutions for Class 10 Math Chapter 6 Triangles are provided here with simple step-by-step explanations. 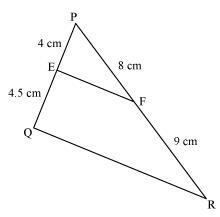 These solutions for Triangles are extremely popular among class 10 students for Math Triangles Solutions come handy for quickly completing your homework and preparing for exams. All questions and answers from the NCERT Book of class 10 Math Chapter 6 are provided here for you for free. You will also love the ad-free experience on Meritnation’s NCERT Solutions. All NCERT Solutions for class 10 Math are prepared by experts and are 100% accurate. In figure.6.17. (i) and (ii), DE || BC. Find EC in (i) and AD in (ii). It is given that DE || BC. E and F are points on the sides PQ and PR respectively of a ΔPQR. For each of the following cases, state whether EF || QR. In the following figure, DE || OQ and DF || OR, show that EF || QR. In the following figure, A, B and C are points on OP, OQ and OR respectively such that AB || PQ and AC || PR. Show that BC || QR. 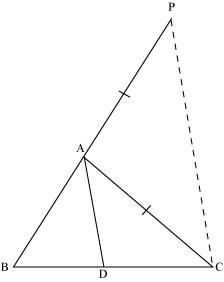 Using Basic proportionality theorem, prove that a line drawn through the mid-points of one side of a triangle parallel to another side bisects the third side. (Recall that you have proved it in Class IX). Consider the given figure in which l is a line drawn through the mid-point P of line segment AB meeting AC at Q, such that . Or, Q is the mid-point of AC. Using Converse of basic proportionality theorem, prove that the line joining the mid-points of any two sides of a triangle is parallel to the third side. (Recall that you have done it in Class IX). Consider the given figure in which PQ is a line segment joining the mid-points P and Q of line AB and AC respectively. 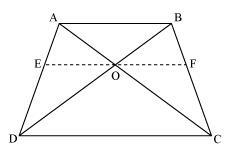 The diagonals of a quadrilateral ABCD intersect each other at the point O such that Show that ABCD is a trapezium. Let us consider the following figure for the given question. ∴ ABCD is a trapezium. (iii)The given triangles are not similar as the corresponding sides are not proportional. (v)The given triangles are not similar as the corresponding sides are not proportional. S and T are point on sides PR and QR of ΔPQR such that ∠P = ∠RTS. Show that ΔRPQ ∼ ΔRTS. In the following figure, if ΔABE ≅ ΔACD, show that ΔADE ∼ ΔABC. It is given that ΔABE ≅ ΔACD. It is given that ΔABC ∼ ΔFEG. It is given that ABC is an isosceles triangle. 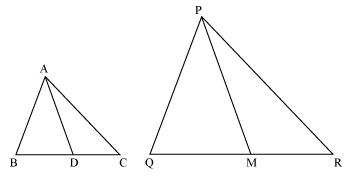 Sides AB and BC and median AD of a triangle ABC are respectively proportional to sides PQ and QR and median PM of ΔPQR (see the given figure). Show that ΔABC ∼ ΔPQR. Median divides the opposite side. We know that corresponding sides of similar triangles are in proportion. Let us extend AD and PM up to point E and L respectively, such that AD = DE and PM = ML. Then, join B to E, C to E, Q to L, and R to L.
We know that medians divide opposite sides. 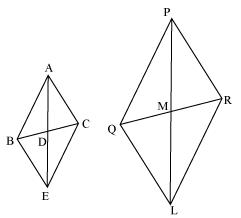 In quadrilateral ABEC, diagonals AE and BC bisect each other at point D.
Therefore, quadrilateral ABEC is a parallelogram. We know that corresponding angles of similar triangles are equal. A vertical pole of a length 6 m casts a shadow 4m long on the ground and at the same time a tower casts a shadow 28 m long. Find the height of the tower. Let AB and CD be a tower and a pole respectively. Let the shadow of BE and DF be the shadow of AB and CD respectively. At the same time, the light rays from the sun will fall on the tower and the pole at the same angle. Therefore, the height of the tower will be 42 metres. We know that the corresponding sides of similar triangles are in proportion. Since AD and PM are medians, they will divide their opposite sides. Let and their areas be, respectively, 64 cm2 and 121 cm2. If EF = 15.4 cm, find BC. 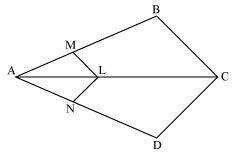 Diagonals of a trapezium ABCD with AB || DC intersect each other at the point O. 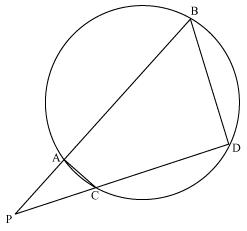 If AB = 2CD, find the ratio of the areas of triangles AOB and COD. Let us draw two perpendiculars AP and DM on line BC. 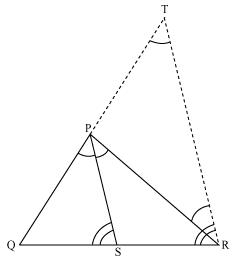 If the areas of two similar triangles are equal, prove that they are congruent. 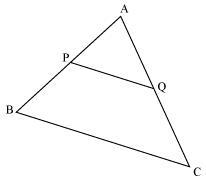 Let us assume two similar triangles as ΔABC ∼ ΔPQR. 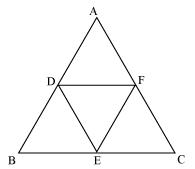 D, E and F are respectively the mid-points of sides AB, BC and CA of ΔABC. Find the ratio of the area of ΔDEF and ΔABC. D and E are the mid-points of ΔABC. of the ratio of their corresponding medians. Let us assume two similar triangles as ΔABC ∼ ΔPQR. Let AD and PS be the medians of these triangles. 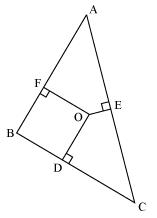 Prove that the area of an equilateral triangle described on one side of a square is equal to half the area of the equilateral triangle described on one of its diagonals. Let ABCD be a square of side a. Two desired equilateral triangles are formed as ΔABE and ΔDBF. We know that equilateral triangles have all its angles as 60º and all its sides of the same length. Therefore, all equilateral triangles are similar to each other. Hence, the ratio between the areas of these triangles will be equal to the square of the ratio between the sides of these triangles. If two triangles are similar to each other, then the ratio of the areas of these triangles will be equal to the square of the ratio of the corresponding sides of these triangles. It is given that the sides are in the ratio 4:9. Sides of triangles are given below. Determine which of them are right triangles? In case of a right triangle, write the length of its hypotenuse. 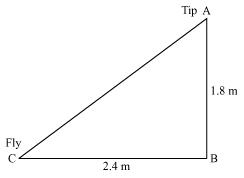 (i) It is given that the sides of the triangle are 7 cm, 24 cm, and 25 cm. Squaring the lengths of these sides, we will obtain 49, 576, and 625. The sides of the given triangle are satisfying Pythagoras theorem. Therefore, it is a right triangle. We know that the longest side of a right triangle is the hypotenuse. 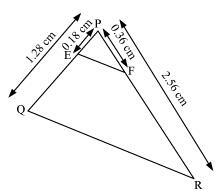 Therefore, the length of the hypotenuse of this triangle is 25 cm. 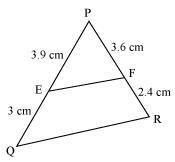 (ii) It is given that the sides of the triangle are 3 cm, 8 cm, and 6 cm. Squaring the lengths of these sides, we will obtain 9, 64, and 36. Clearly, the sum of the squares of the lengths of two sides is not equal to the square of the length of the third side. Therefore, the given triangle is not satisfying Pythagoras theorem. Hence, it is not a right triangle. (iii)Given that sides are 50 cm, 80 cm, and 100 cm. Squaring the lengths of these sides, we will obtain 2500, 6400, and 10000. (iv)Given that sides are 13 cm, 12 cm, and 5 cm. Squaring the lengths of these sides, we will obtain 169, 144, and 25. 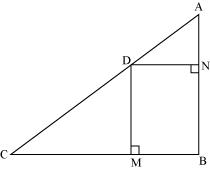 Therefore, the length of the hypotenuse of this triangle is 13 cm. PQR is a triangle right angled at P and M is a point on QR such that PM ⊥ QR. Show that PM2 = QM × MR.
ABC is an isosceles triangle right angled at C. prove that AB2 = 2 AC2. Given that ΔABC is an isosceles triangle. ABC is an isosceles triangle with AC = BC. If AB2 = 2 AC2, prove that ABC is a right triangle. ABC is an equilateral triangle of side 2a. Find each of its altitudes. 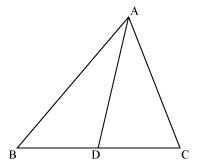 Let AD be the altitude in the given equilateral triangle, ΔABC. 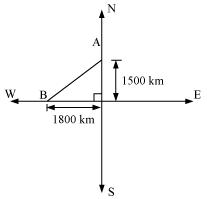 We know that altitude bisects the opposite side. In an equilateral triangle, all the altitudes are equal in length. Therefore, the length of each altitude will be . Prove that the sum of the squares of the sides of rhombus is equal to the sum of the squares of its diagonals. Join OA, OB, and OC. A ladder 10 m long reaches a window 8 m above the ground. Find the distance of the foot of the ladder from base of the wall. Let OA be the wall and AB be the ladder. Therefore, the distance of the foot of the ladder from the base of the wall is 6 m.
A guy wire attached to a vertical pole of height 18 m is 24 m long and has a stake attached to the other end. How far from the base of the pole should the stake be driven so that the wire will be taut? Let OB be the pole and AB be the wire. Therefore, the distance from the base is m.
An aeroplane leaves an airport and flies due north at a speed of 1,000 km per hour. At the same time, another aeroplane leaves the same airport and flies due west at a speed of 1,200 km per hour. How far apart will be the two planes after hours? Let these distances be represented by OA and OB respectively. Therefore, the distance between these planes will be km after . Two poles of heights 6 m and 11 m stand on a plane ground. If the distance between the feet of the poles is 12 m, find the distance between their tops. 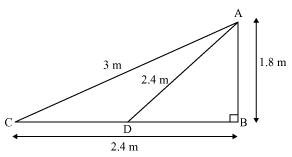 Let CD and AB be the poles of height 11 m and 6 m.
Therefore, the distance between their tops is 13 m.
In an equilateral triangle ABC, D is a point on side BC such that BD = BC. Prove that 9 AD2 = 7 AB2. Let the side of the equilateral triangle be a, and AE be the altitude of ΔABC. In an equilateral triangle, prove that three times the square of one side is equal to four times the square of one of its altitudes. Tick the correct answer and justify: In ΔABC, AB = cm, AC = 12 cm and BC = 6 cm. The given triangle, ΔABC, is satisfying Pythagoras theorem. Therefore, the triangle is a right triangle, right-angled at B. In the given figure, PS is the bisector of ∠QPR of ΔPQR. Prove that . Let us draw a line segment RT parallel to SP which intersects extended line segment QP at point T.
Given that, PS is the angle bisector of ∠QPR. ∴ DMBN is a rectangle. 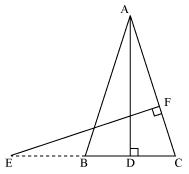 The condition to be proved is the case when D is the foot of the perpendicular drawn from B to AC. 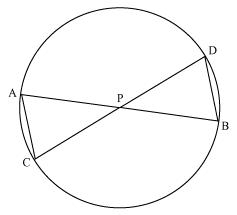 D is the foot of the perpendicular drawn from B to AC. 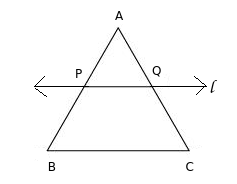 In the given figure, ABC is a triangle in which ∠ABC> 90° and AD ⊥ CB produced. Prove that AC2 = AB2 + BC2 + 2BC.BD. 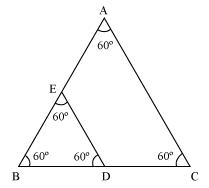 In the given figure, ABC is a triangle in which ∠ABC < 90° and AD ⊥ BC. Prove that AC2 = AB2 + BC2 − 2BC.BD. Prove that the sum of the squares of the diagonals of parallelogram is equal to the sum of the squares of its sides. Let ABCD be a parallelogram. Let us draw perpendicular DE on extended side AB, and AF on side DC. We know that the corresponding sides of similar triangles are proportional. 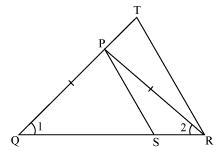 (ii)We know that the corresponding sides of similar triangles are proportional. In the given figure, D is a point on side BC of ΔABC such that . Prove that AD is the bisector of ∠BAC. Let us extend BA to P such that AP = AC. Join PC. 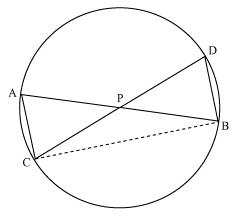 ⇒ AD is the bisector of the angle BAC. Nazima is fly fishing in a stream. 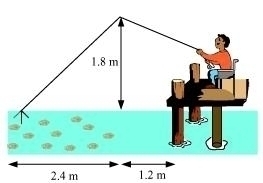 The tip of her fishing rod is 1.8 m above the surface of the water and the fly at the end of the string rests on the water 3.6 m away and 2.4 m from a point directly under the tip of the rod. Assuming that her string (from the tip of her rod to the fly) is taut, ho much string does she have out (see Fig. 6.64)? If she pulls in the string at the rate of 5 cm per second, what will be the horizontal distance of the fly from her after 12 seconds? Let AB be the height of the tip of the fishing rod from the water surface. Let BC be the horizontal distance of the fly from the tip of the fishing rod. Then, AC is the length of the string. 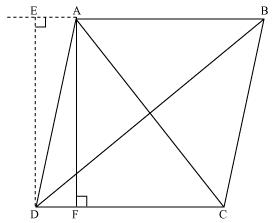 AC can be found by applying Pythagoras theorem in ΔABC. Thus, the length of the string out is 3 m.
She pulls the string at the rate of 5 cm per second. Let the fly be at point D after 12 seconds. Length of string out after 12 seconds is AD.